Visit the ISB Network Alumni Association Facebook page here. See current posts and information presented by your classmates! If you are not currently a member of the ISB Network Alumni Association Facebook page apply today! Would you like to become a member of the ISB Network? See the new “Thai Restaurant Flyer” for details! 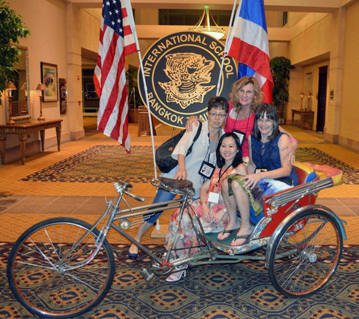 The ISB Network Foundation, Inc. is a not-for-profit, 501 C-3 organization comprising members who are devoted to serving the International School Bangkok, its alumni and students, and the Kingdom of Thailand. We are dedicated to bringing ISB alumni together to maintain and support the unique relationships and experiences that tie us together and keep us connected to our time at ISB and in the beautiful Kingdom of Thailand. We were founded in 1983 by a handful of alumni from the classes of ’73, ’72 and ’71 who just wanted to get together and have a reunion! From a humble list of about 100 names and addresses, interest grew to include other classes who wanted to participate in the reunions and today that list stands at more than 6100…and growing! Help us expand our list by joining the ISB Network today! We are ISB alumni serving ISB, its alumni and students, and the Kingdom of Thailand. Every two years, we sponsor and host the ISBN All Classes Reunion where alumni come together to celebrate our history and re-connect with old and new friends from ISB. We also support and maintain the ISB Network website and a database of alumni and ISB Network members. We are also proud to sponsor and fund the “ISB Network Scholarship and Community Service Award.” Established in 2002, the award provides a total of $3000 to two Thai National students attending ISB. The money is then donated by the winners to support community service projects in Thailand. The ISB Network considers you an alumni if you attended ISB—even if only one semester! You need not have graduated to become a member of the ISB Network and participate in our activities. The ISB Network is managed by a volunteer Board of Directors (BOD) who do not receive payment for their time and effort. The BOD welcomes feedback from ISB Network members and alumni at anytime and we also hold an open meeting during the All Classes ISB Network Reunion to report out on our work and answer questions. While the BOD works hard, we need your talent and support! If you are interested in volunteering to serve on the BOD, or work with any of the BOD members, please contact us. Ever wonder “where are they now?” Find out! Chances are your long lost friends are in our database and if they aren’t, let us know so we can work to find them. To search for your friends, go to the Alumni Directory. The ISB Network is pleased to sponsor a mentorship program that links professional and other expertise of our alumni with other alumni looking to develop skills in those areas. Fill out the mentor/networking section of your account to join the mentor networking program and use the mentor/networking search function. The ISB Network is supported by dues paid by our members. The dues allow us to maintain the website, sponsor the All Classes Reunion, and sponsor the “ISB Network Scholarship and Community Service Award.” You don’t have to be a member to be in our Alumni Directory or to attend the reunions, but you support is appreciated! join here. Class Reps are your liaison to the ISBNETWORK. Click here to see the list of Class Reps! If you have previously opted out of communications via our emails through Constant Contact and would like to opt back in, please CLICK HERE.